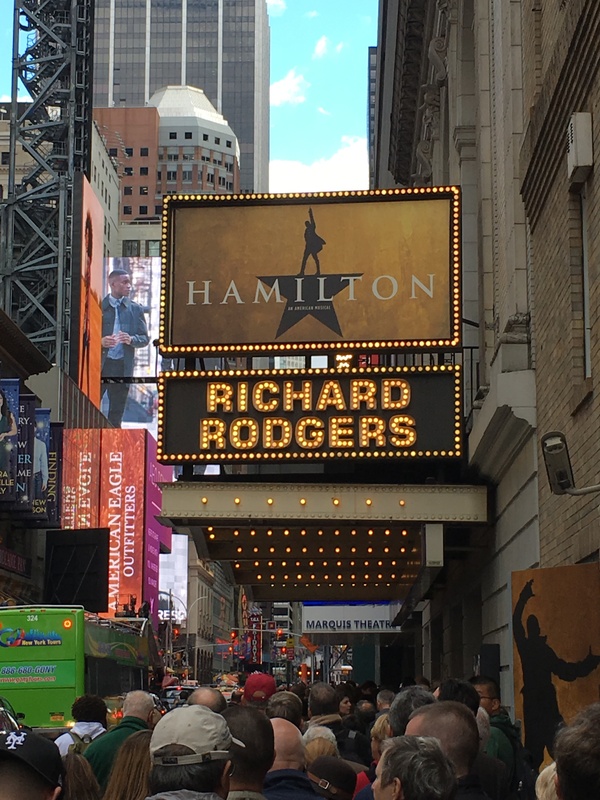 Hamilton, the musical that recently opened at the Richard Rogers Theatre, is everything you have heard it is — it is one of the strongest pieces of musical theatre to open in years, and it deserves all the praise that it being heaped upon it, mine included. Don’t know who Alexander Hamilton is? (or A.Ham as he is referred to numerous times in the script) — take a look at your wallet and see if you have a ten-dollar bill in there. Hamilton was the first US Secretary of the Treasury shortly after the revolutionary war. But what do American’s really know about him? Really, not much (unless you are a scholar of the people involved in government at that time). He rose to fame under the direction of George Washington — a scrappy and highly intelligent immigrant. He married well. He had a scandalous affair that prevented him from running for higher office. He was shot by Aaron Burr. No, seriously, you didn’t know all that? Well neither does 99.99 percent of the audience at each performance — and it is thrilling to watch it all play out. The action is non-stop under the superb direction of Thomas Kail, choreography of Andy Blankenbuehler, and musical direction of Alex Lacamoire. The book, music, and lyrics (and star of the show himself) are by Lin-Manuel Miranda (“In the Heights”). The script is based on the book “Alexander Hamilton” by Ron Chernow. Not big into history? I bet many of you will be looking up this book to read after seeing the show. All of the leads in this musical are exceptional — the multicultural cast is led by the aforementioned Mr. Miranda, as well as Daveed Diggs, Remee Elise Goldsberry, Jonathan Groff (hilarious as King George with the evening’s most tuneful song, “You’ll be Back”), Christopher Jackson, Jasmine Cephas Jones, Javier Muniz, Leslie Odom, Jr, Okieriete Onaodowan, Anthony Ramos, and Phillipa Soo with an additional ensemble cast of 17 others. The hip-hop infused score shouldn’t scare you away — while much of the show is performed in rap, its better to call it “rhyme” here — it is melodic, and it is infused with vocal riffs. The talent on display here is remarkable. You will find yourself listening to the cast album repeatedly after seeing the show. I will be the first to tell you that I absolutely hate rap music — this is not rap music. This is a hybrid of pop, rock, hip-hop, and Broadway tuners. Everything moves quickly here — on a near-constantly rotating turntable set — which allows for some ingenious staging of scenes in which the audience can alternately see what is happening both in front of the characters, and behind them. As the show progresses, cannons and rifles flare, scenes shift rapidly from board room to living room to street, to river, to forest. The true ensemble play various roles, and echo actions on stage with dance and movement. It is truly remarkable. Your eye wanders from lead to dancer back to lead as you take it all in. The show demands repeat reviewings — not that I’ll be able to see it again anytime soon; its sold out through May 2016 (though there are scalpers tickets and secondary sales to be had and stubhub and private ticket agencies). The rotating set also allows the show to build momentum and this is nowhere as well on display as in its three dueling sequences – it creates an almost movie-like effect as characters swirl before you — and tension mounts on a choreographed count of 10 — and guns fire. During a brilliantly staged sequence, the bullet is carried by one of the ensemble members in a finely choreographed slow-motion sequence across the stage from one side to the other until it reaches its intended victim. Pow. One of the most wonderful sequences I’ve seen in a Broadway show in many years. There are two caveats — this is not a family show, so leave the kids at home. Most won’t understand what is going on or will be bored by the very adult content matter – and politics. This is a show about ideas, and Lin-Mauel Miranda has filled the stage with things to talk about and think about and discuss afterwards — by adults. Second, if English is your second language, this isn’t going to cut it for you. The dialogue is rapid fire; the politics discussed require a good grasp of English, and even then reading the libretto while listening to the cast album is the only way to catch everything going on. The poor Israeli family sitting next to me who bought tickets because of the critics raves was utterly lost, and two of them left at intermission while one struggled bravely on.